Do you think you could make the world a better place? 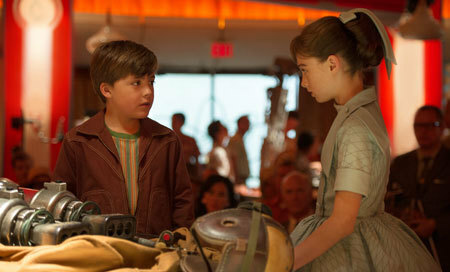 Check out Kidzworld’s review of the hopeful Disney film Tomorrowland. If you were a very smart, inventive teen who has wanted to fly to the stars since a very young age and you got a chance to visit an otherworldly, futuristic city and change our troubled planet forever, would you have the courage to go? In present-day Florida, smart, tech-savvy teen Casey Newton (Britt Robertson) lives with her almost out of work NASA engineer dad (Tim McGraw) and desperately wants to keep a NASA launch site from shutting down. 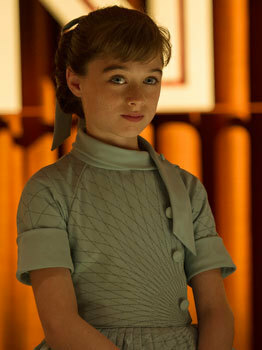 Athena (Raffey Cassidy), a mysterious young girl, secretly slips Casey a strange pin that reveals a glimpse of Tomorrowland, a futuristic city in another dimension but only when Casey touches it. In a flashback to the 1964 World’s Fair, the same Athena meets whip-smart boy inventor, Frank Walker who has invented a flying jet pack and she recruits him to live and invent in Tomorrowland. 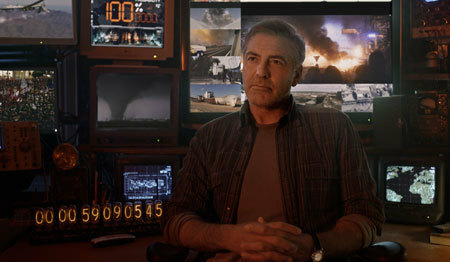 Back in the present, Athena makes sure Casey finds the secretive, now fifty-something Frank (George Clooney), who is monitoring transmissions from Tomorrowland that predict that our world will end soon. 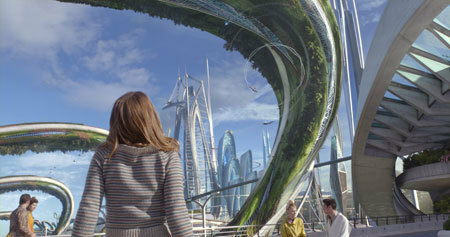 It seems that Casey, with her smarts and optimism for the future, is just what Tomorrowland needs to save our planet. Frank, Casey and Athena work together to escape some evil robots who don’t want Earth to survive. The trio manages to make it to a rocket cleverly hidden long ago under the Eiffel Tower in Paris to blast into space and finally get back to Tomorrowland where they confront the human leader of the bad guy robots Governor Nix (Hugh Laurie) and work to save the Earth. Casey and Frank then hope to rebuild our tomorrow. 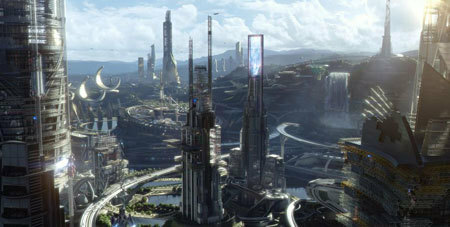 Tomorrowland is certainly overall entertaining but the film could have used more Guardians of the Galaxy-style humor among the lead characters. The subject matter (Earth having a very short time to “live”) is mega-serious so lightening up more would have benefitted the movie. It’s kind of a bummer that not enough time is actually spent in Tomorrowland which has the amazing production and artistic design we expect from Disney. It’s refreshing to see a film that presents a hopeful future world rather than the more negative, post-apocalypse scenarios we see in The Hunger Games and Divergent and it’s great that the filmmakers included not just scientists but dreamers who think outside the box and people involved in the arts; music, writing, dance, etc. in those chosen to build a better future. However, the film is teachy/preachy with the message that humans are their own worst enemy and we need to get it together soon before we destroy ourselves. This idea certainly isn’t new to films but at least it is really laid down here with style and amazing special visual effects. The story, especially in what the “bad guys” are trying to accomplish, is a bit confusing and illogical especially for younger audience members but you might just get caught up in the cool visuals on screen and not care. There is one character who saves the day that we are supposed to be very emotionally connected to and, for me, it just didn’t happen. Maybe using more of the humor for character-bonding that I mentioned would have helped in this regard. 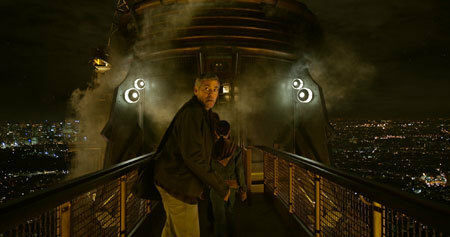 George Clooney enacts a great mix of burned-out inventor with a squishy emotional core. 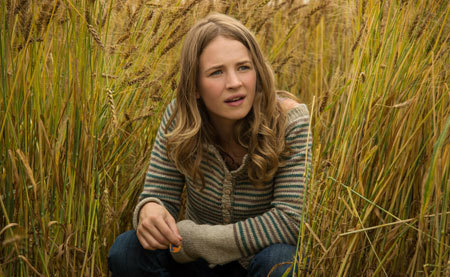 Britt Robertson is convincing as a smart young woman with a strong determination to make her world a better place and newcomer tween Raffey Cassidy is pretty amazing playing a character who seems an “old soul” when we consider her apparent age. 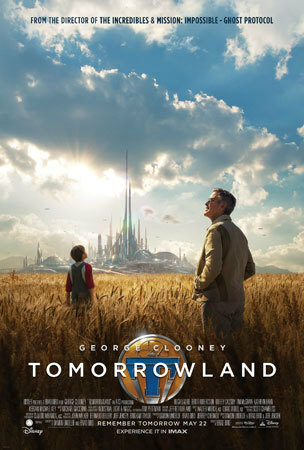 In these scary times, with terrorist groups swearing to wipe out most of the world to set up their sick idea of tomorrow, it’s nice to see a film that still believes there are enough of us creative dreamers left on the planet to band together and create a better future but Tomorrowland falls a little short of painting a perfectly entertaining picture of how we accomplish this. We go three stars. 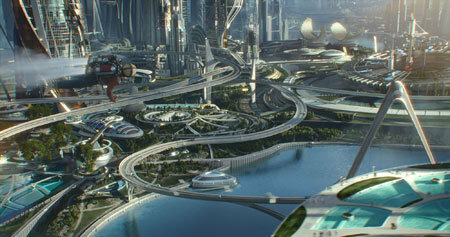 Tomorrowland is in theaters now!